Spalangia nigroaenea, photographed by Philippe Blanchot. The Spalangiinae are a group of parasitoids of Diptera. Some species of Spalangia have been used in the biological control of synanthropic flies and sheep-maggot flies (Bouček 1988). 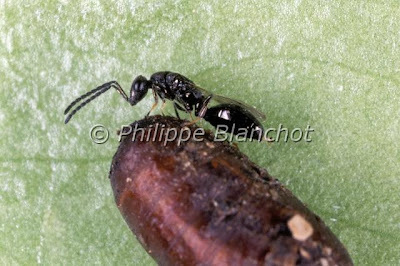 Characters (from Bouček 1988): Body black or slightly metallic; at least thorax with some distinct punctures or rugosity, often also head; frons with median punctured groove; antennal toruli situated on lower margin of head, overhanging the mouth; antenna 1171 i.e. with 7 funicular segments but no anellus; scutellum without sublateral lines but often with punctate frenal line; gaster on distinct petiole; forewing disc flat, pubescent, without a tuft of scales; marginal vein very long, stigmal and postmarginal veins short.